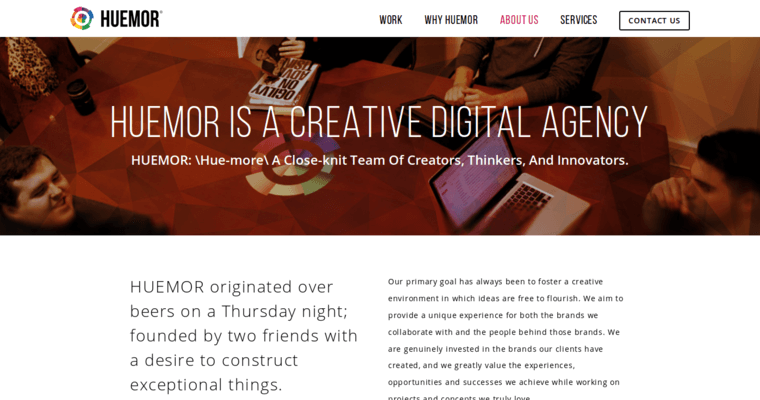 Huemor Designs is a top digital agency that describes itself as having big-time talent and an underdog approach to digital marketing in general. Huemor Designs uses superior data tracking to help generate the best possible return on investment for its many clients. Huemor Designs is independently owned and is currently operating in 14 different industries. Since this firm was founded in 2011, it has grown rapidly to include a team of 15 digital marketing experts. Huemor Designs has a very prestigious client list, including Geico, Alliant, Arakadium, NBC Sports, United Way, Allied Reliability Group, Valley Lighting and many more. Some of the top notch services provided by Huemor Designs include analytics and research, digital branding, web design, competitor research, performance optimization, maintenance and growth, email marketing, SEO, experience optimization, content strategy, front-end web development and content management systems. Huemor Designs is also able to work within any reasonable budget range.